–Asif Ali Zardari’s frustration on Pakistani media during an address to businessmen from Khyber Pakhtunkhwa, Islamabad 2009. 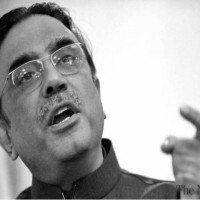 Asif Ali Zardari was addressing members of the delegation of the Sarhad Chamber of Commerce and Industry (SCCI), during which he commented on the role of journalists in Pakistan. The president and the PPP-led federal government had come under growing criticism by most of the media due to their handling of the situation in the wake of Mumbai attacks.The government then deniedthat the president ever said such words and has reiterated how the elected civilian government is committed to press freedom and the welfare of journalists. The journalist who wrote the piece stood by his story. Undoubtedly, Pakistan is an extremely challenging environment for journalists to work in. The rising violence and threat to journalists’ personal safety undermines whatever little press freedomis allowed by the country’s many power centers. Insecure and authoritarian governments, as has mostly been the case in Pakistan’s six-decade history, are wary of a vocal and critical press.